Bologna Process Coordination Board met at Senate Hall under the chairmanship of Bologna Coordination Board President, Prof. Dr. Muharrem Certel, on Friday, 18 March 2011 between 09:30-11:30 a.m. In the meeting, firstly the guide which was prepared for Information Package Templates discussed and the participant’s opinion were taken. Secondly, the information was given about BP Department and School of Foreign Languages Meeting dated 16 March 2011 and the decisions were discussed. Finally, determining the agenda of BCC Meeting which will be met on 23 March 2011, creating a commission for monitoring and evaluation of the Bologna Process Curriculum Revision's works and determination of the members were agreed. 1. Guide about course introduction form which should be completed by 15 April 2011 with in the framework of Bologna Process harmonization activities, will be published on the ABKO’s web page. 2. Decisions which were taken in the Departments and School of Foreign Languages meeting, dated 16 March 2011, will be exactly accepted. 3. A commission will be organized for monitoring and evaluating Curriculum Revision works with the Faculty of Education's faculty members who are named in the following. 4. The President of this commission is responsible to Bologna Process Coordinator, BCC President and Rector and will present commission reports in this order. 5. 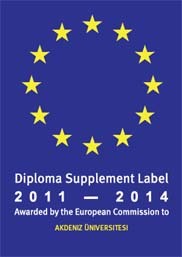 In the next coordination committee meeting, the issue of DS Label Application will be discussed in detail.